have to deal with the officialdom who inherited and followed the Official Secret Act 1923. The blend of secrecy can be found in every rule, notification, policy and procedure. After RTI laws, every piece of information is public until declared exempted from public disclosure. Citizens are the owners of information and records held by public bodies. Information is power and providing citizens with it is the basic tool for empowering them. The whole edifice of RTI is constructed on this basic fact. Officials are entrusted with the sacred duty to maintain data on citizens’ behalf. Therefore, the information should be readily available to citizens as and when required. Both Punjab and KP RTI laws have clauses enlisting categories of information which should be proactively disclosed by public bodies. The big question, however, is how much time the public bodies will take to acclimatise themselves to transparent governance. The K-P information department is the first public body which has put most of its record online. The online records include advertisements issued to different newspapers, minutes of meetings, perks and privileges, organisation rules, policies, procedures, salaries of staff, categories of information in departments and so on. Other departments should follow the example set by the K-P information department. Internet density in Pakistan is still very low and public bodies should find ways for proactively sharing information with citizens. One way of disclosing information could be to display all important information at the main entrances of offices, such as names of staff members, duty times, medicine and health equipment available (in the case of health facilities), number of students enrolled and funds for school management committees (schools and colleges), key details and material specifications from PC-1 on construction sites of roads, water and sanitation schemes, detailed lists of FIRs displayed on the gates of police stations. This will greatly increase the citizens’ role in holding the public service providers accountable. Proactive disclosure will greatly reduce the burden on public bodies as well. 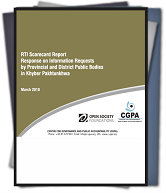 Upon the filing of an information request, public information officers (PIOs), designated in each public body under RTI laws, must provide information. If the PIOs do not provide information, then a complaint may be lodged with appellate bodies. The rule of thumb is if one person is provided with information, that piece of information should be available to everyone. If one person asks for the merit list of an interview, why not publicly disclose the merit list online for all who wish to view it? Out of the total of 291 complaints received by the K-P information commission in 2014, 93 were concerning different reports, 66 were related to data and statistics, 61 were related to recruitment and vacancies, and 38 were related to merit lists and interviews. Out of a total of 1,019 complaints received by the K-P information commission in 2015, 131 were related to recruitments and vacancies, 81 were related to information on tests and interviews, and 172 were related to data and statistics. These are exactly the categories of information which should be proactively disclosed under the KP RTI law. Open data and open governance is the way forward for ensuring effective public service delivery. The sooner the Pakistan federal, provincial and district governments adopt policies for proactive disclosure of information, the better.